PLEASE VISIT OUR HOME PAGE TO LEARN MORE ABOUT THIS WEBSITE. 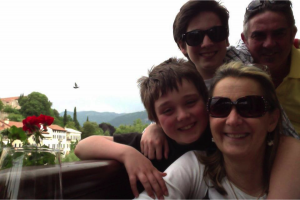 Peta L Lowry is a successful business owner, an ex Corporate career woman with over 30 years experience, a wife to an amazing supportive husband, a Mamma to two beautiful boys and an Australian living her dream life in Italy. Everybody from her family, work colleagues, friends and even the Italian Consulate told her it was an impossible dream and that she wouldn’t be able to achieve it. Yet, today she is successfully based in Italy with her two bilingual children and her husband running a profitable business that she’s busy growing and going online with and making plans to extend their stay for another couple of years! Peta has always believed in planning, from a young age she has known what she has wanted to do and worked hard at developing plans to enable her to achieve her dreams. Her working career of over 30 years in corporate Australia saw her in roles that demanded structure, process and delivery and she has taken this experience and skill and developed a unique methodology to be able to deliver the achievements of her working career to her life. She has studied under many business and life coaches and pulled together all the key elements of this learning to be able to deliver to you her unique dream, believe, plan, achieve program. She offers a simple three step program to keep you on track and working towards your dream life. Goal and achievement driven, Peta will take you on as one of her business goals and work with you. The program begins with her FREE “First Steps – 21 Day plan” with key milestones and checkpoints at days 2, 3, 5, 8 and 13 to help you define your dreams and transform them from “daydreams” to reality. This “first steps” plan enables you to achieve the first major milestone on your project plan to your dream life.